It’s not Fashion. It’s Mission. Alone but not Lonely. And Still Writing. Be Strong. Be Safe. Have Fun. Missing the School Bus. Seizing the Day. Love Your Life. Every Minute of It. Come With Me. Let’s Escape. Mom, Can You Hand Me _____________? Maybe I should have started with shirts? 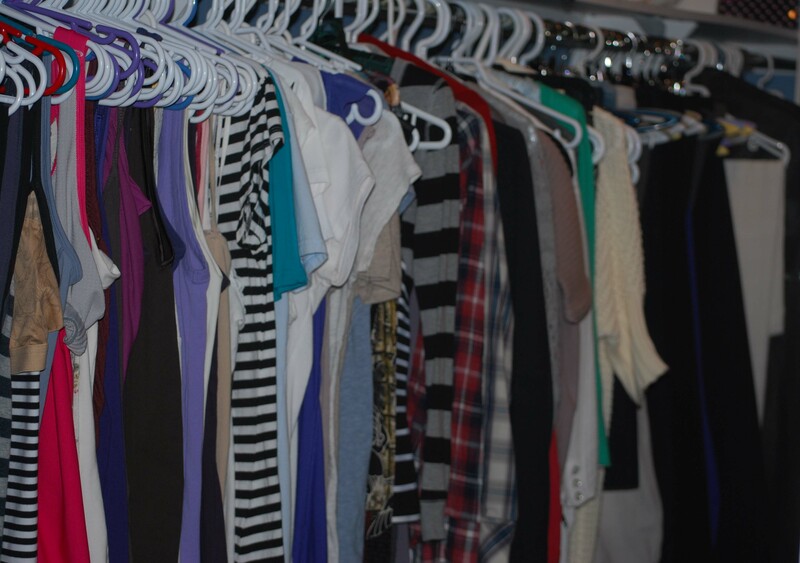 It all started with hangers. Pant hangers. You know the ones that lever together at the top and clamp onto the hem of your pants? And if they’re the cheap kind, then your pants just kind of slide out and land in a heap on the floor? Well, those. Pant hangers. I needed some. So I jotted it on my To Do list. Grocery store. Goodwill drop-off. Hardware store for pant hangers and clothes pegs. But wait a minute. Did I really need hangers, or was the real problem that I have too many pants? And so here I am now, with two dozen pairs of pants spread out on my king-size bed. If I take seriously the question posed in my blog– what happens when we let go – then paring down my clothes seems a logical undertaking. All I need is a protocol, rules of engagement, and these I learned at the foot of a Master, Clutter Control author, Jeff Campbell. One of Jeff’s rules is “Pick a number and Stick to it”. Right. I turn to my grey cat, Miley, for support. Everyone else in the family is engaged in more pressing matters. She looks at me, unblinking. I know what she’s thinking. She’s thinking I should be starting with shoes, not pants. Miley rises, walks in a circle and re-settles on a pair of slim, velvety-soft black straight-legs that I picked up on a trip to the States. A puff of her just-shed hair instantly insinuates itself into the fiber. Right. Whenever I wear these I look like a giant lint brush. I hesitate though: I like these pants because of the flattering cut. Miley stretches out a paw, lays it on the waistband. Yes, they are indeed pilling at the top. OK, be brave, I tell myself. Just whip them out from under the cat, roll them in a ball and toss them in the bag. I reach for them, then stop. This is why I love him. He is kind, affectionate and generous with compliments. He also has no fashion sense whatsoever. I glance at the pile and spot a pair of peg-leg capris, belted with a ribbon. I pick them up. Not flattering I think. They sit too low on my hips, and with the cropped leg, I look like a munchkin. I toss them in the garbage bag. Miley looks at me and yawns. I smile back at her and reach for another pair. One down, ten more to go. At this rate, it may be spring before I’m done, but never mind. I’ll persevere. Fewer pants, fewer hangers, and one very wise grey cat.